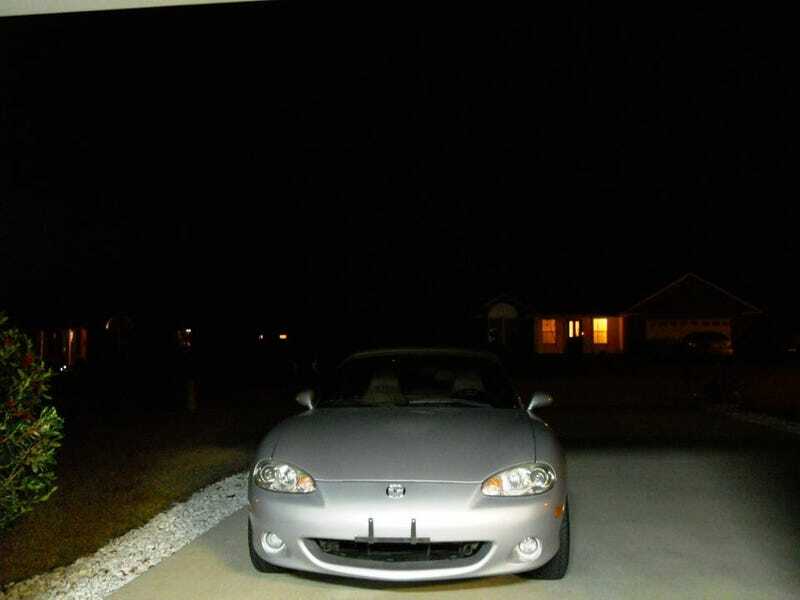 This is the first ever picture of my 2002 Mazda Miata, taken on January 5th, 2013, minutes after a 3 hour drive from the Mooresville dealership to my parents’ house. A humble 54.7k mile LS-packaged car that was owned by someone with a dog in southern Texas for most of its life before spending a year between multiple dealerships. It needed work; the interior had dog hair everywhere, the silver paint on the rims was bubbling and flaking off, and the gas tank had rust clogging up both the fuel pump and the fuel filter. This car was loaded for a Miata with the larger sport brakes, Bilstein suspension (pops accidentally replaced it with cheap SenSen shocks instead of getting them re-valved), tan top and interior (classy), and the most coveted Miata part, a Torsen Limited-Slip Differential. Here’s the car as it is today after numerous modifications (as Mr. Regular said, each owner customizes their Miata to make it unique) and 25.3k miles filled with drives all across the state of South Carolina, autocrosses, mountain runs, and breakdowns. First came the green hardtop as the only upgrade of 2013, then the used Racing Beat front sway bar kit early 2014, next the used Roadster Sport exhaust mid-pipe (shush, it’s not legal for my auto-x class) and muffler, followed by used Konig Helium 15x6.5 wheels, by 2015 it was time for new Koni Sport shocks and FatCat Motorsports bumpstops, silver interior trim from a newer ‘03+ Miata started appearing later that year along with a rare Mazdaspeed mirror, and finally wrapped (literally) the windshield frame in black vinyl to match the newly-repainted hardtop to complete the two-tone look. Of course, like most car enthusiasts, I’m never done modifying and tinkering with my vehicle. I’m planning on mounting the wooden Nardi knob and parking brake handle very soon while I continue searching for an ‘01 SE wooden steering wheel. My performance-wise options are limited due to the rules of my stock autocross classing but new tires are a must later this year as the used Nitto NeoGens reach the end of their limited performance interval. However, I’m slowly accumulating money to afford some OEM JDM goodies like the Japanese-only cams, intake, throttle body, ecu, and 4-2-1 header to pick up an extra 10-15hp along with a 500 rpm-higher redline. Will this bump me out of stock class? Yes, but I won’t say anything about it until I’m caught~!